Oregon Coast baskets. Aqua blue is the most common color I found on the Oregon coast. This year’s Pacific Ocean basket series is my biggest, most colorful series yet! 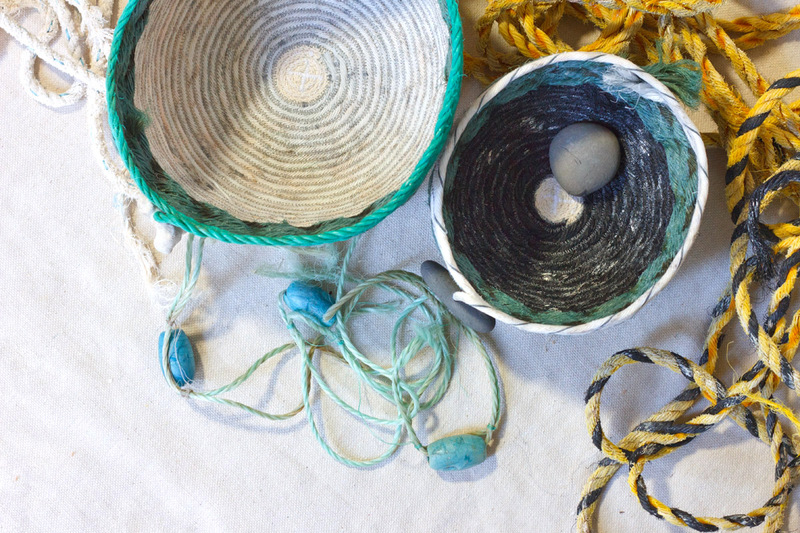 I made 24 baskets with fishing rope salvaged from the coastlines of Oregon and Kauai. I had new colors and textures to work with – bright yellow, fuzzy dark green, and lots of slippery emerald that floated all the way to Oregon from Japan. Ukidama baskets, made with rope from Japan found in Oregon. These are named for the Japanese fishing floats that came with them. 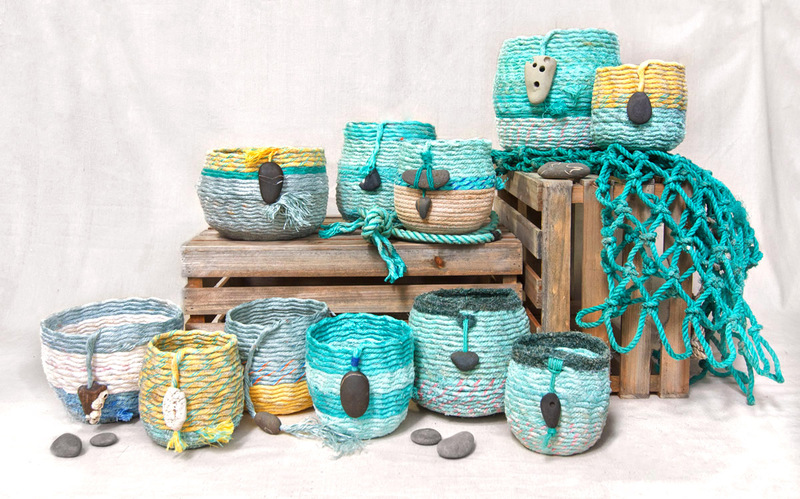 I made the choice to keep the rope from different places separate, so there are actually three collections in the Pacific Ocean series: Oregon Coast baskets, Kauai baskets, and the baskets I made using rope from Japan. 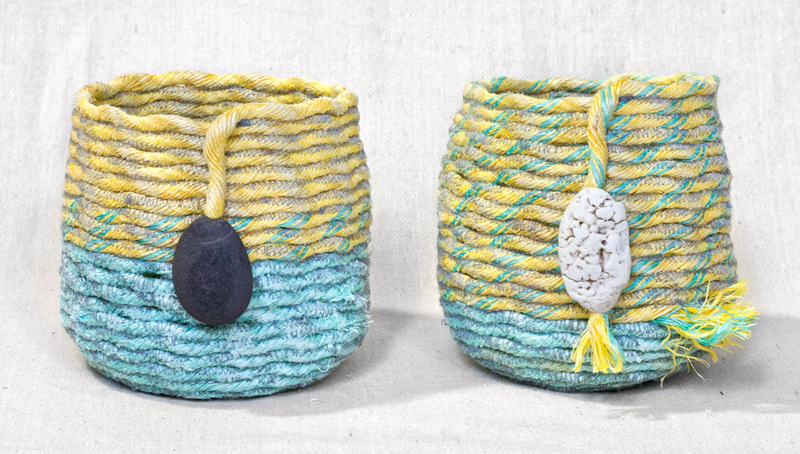 This is my third series of ghost net rope baskets since I first started making them in 2015, inspired by the colorful flotsam I found on every coast. I spent two weeks this spring stitching 24 baskets, a Basket Bonanza compared to last year’s series of just 8 baskets! It was fun to have the time to make matching pairs and sets, experimenting with an idea in color or pattern. New this year, each of the Pacific Ocean baskets includes a seashell-like coil of white cotton rope at the very center of the basket base. It’s a surprise reward you get for peeking inside! 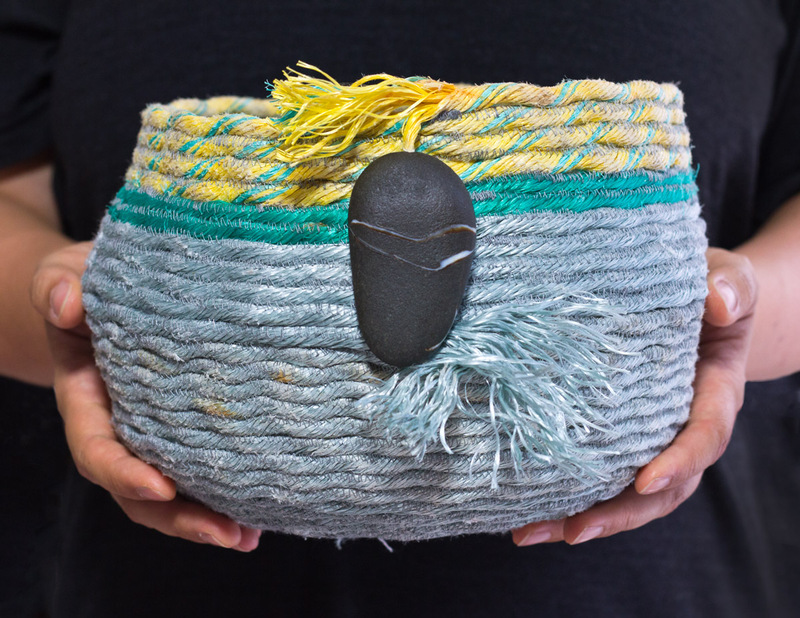 After months of collecting beach stones up and down the Oregon coast, and on Kauai, I spent one full week choosing a stone or two to finish each basket. The anchor stones are all beachcombing treasures: rocks with holes bored by clams, fossilized seashells, and sculptural bits of coral. I am a collector by nature, and this project gave me an excuse to come home with a bag full of rocks on several occasions! 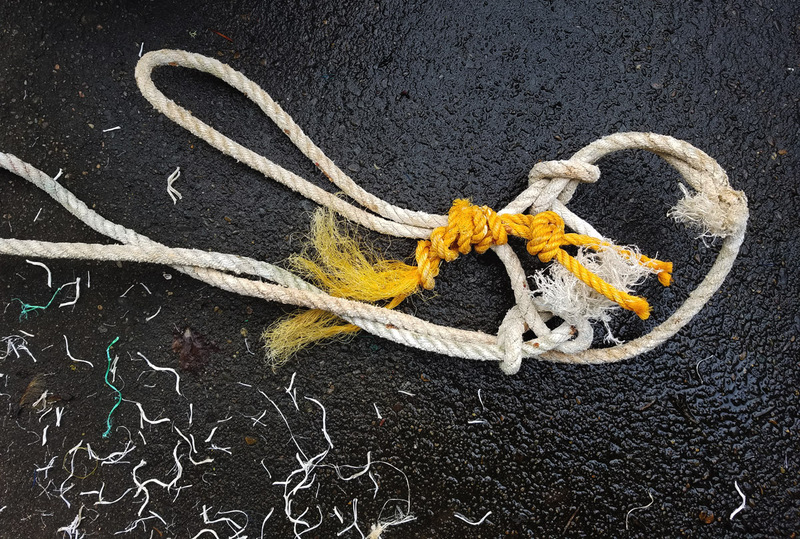 I love working with the weathered texture and bright colors and patterns of the rope that I find. I don’t do any dyeing, just a good scrub in hot soapy water. Sometimes the brightest pieces fall apart during the wash, and I’ve found myself reluctant to just throw them “away,” as I become more and more aware that away is a place. I have a new idea for the tiny fragments involving handmade paper and erosion… but it will have to wait until next year! A portion of the proceeds benefits local ocean conservation groups!